When Apple’s AirPods exploded in popularity, it was only a matter of time before the big names in personal audio jumped on the truly wireless bandwagon. And as far as big names in personal audio go, it doesn’t get much bigger than Bose. We’ve been waiting rather impatiently to see Bose quality sound arrive in a cord-free wireless from factor, and now the Bose SoundSport Free Truly Wireless Sport Headphones are almost here. 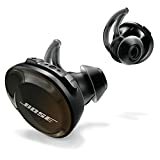 They’re pricey compared to AirPods, but anyone who has used Bose products before knows that they’re worth every penny. They weren’t supposed to be released until next week, but they just launched early on Amazon so grab a pair while they’re still in stock!